First the good news, it looks like I have qualified for the Western Australia ultimates tournament which is our master event. The bad news is the tamurkhan chaos dwarf list is not eligible for use. Although all qualifying events have allowed the use of chaos dwarfs and I am disappointed I thought instead I would use my chaos dwarfs as dwarfs. Heresy to some but substituting is pretty straight forward with infantry and and some war machines such as magma cannon as flame cannon and old earthshaker as cannon. Obviously no iron daemon, bull centaurs or hobgoblins but I did find my old avatars of war berserkers who needed some cosmetic surgery to give them a proper nose and some proper teeth courtesy of some dryad bits. 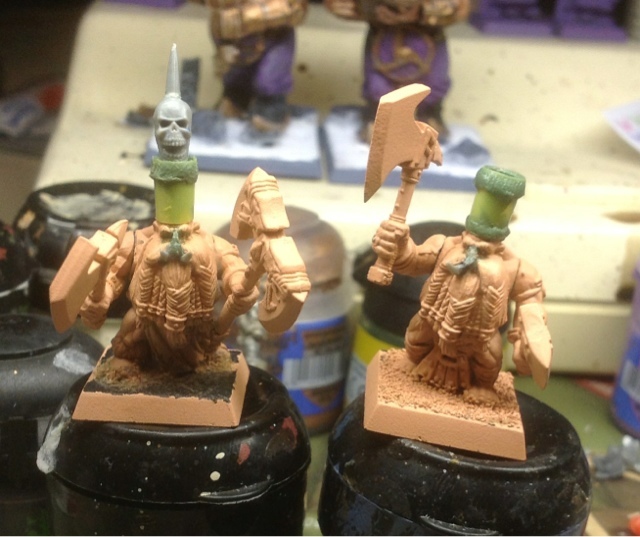 Although slayers are known for their Mohawks these dudes will still be sporting some serious big hats. These are a couple of work in progress dudes. The big hats will have transfers from the old chaos dwarf transfer sheet as symbols rather than the gold symbols like the rest of the army. Hashut protective tattoos will also be applied. Updates to follow pending my new son and his sleep patterns.